Last semester when I was formulating my plans for programming in the spring 2015 semester, I was short on ideas for my teens. So, I sat them down after my Hunger Games Challenge in the fall and asked what they’d like to see me do. 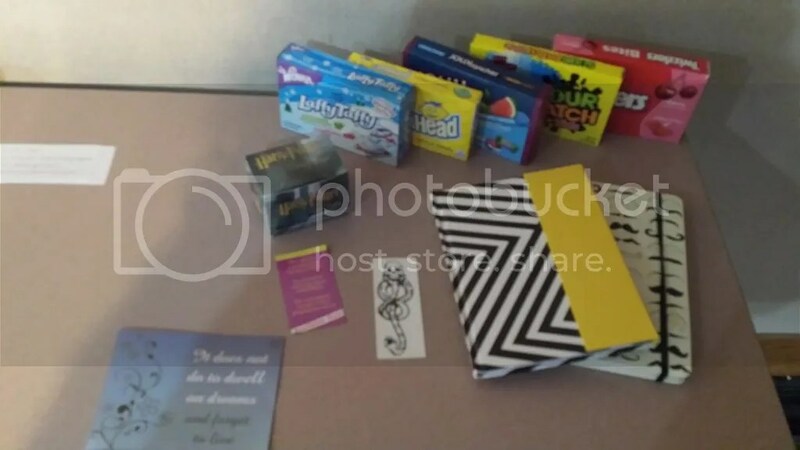 They told me that they’d like more game show programs (hence my Family Feud program) and that they would like for me to do a Harry Potter program, even though it was “old” because no other librarians in the system would do that until the release of Fantastic Beasts and Where to Find Them rolled around. I was thrilled! Harry Potter is my fandom. I love other books and belong to a variety of other fandoms, but Harry Potter is my main one. 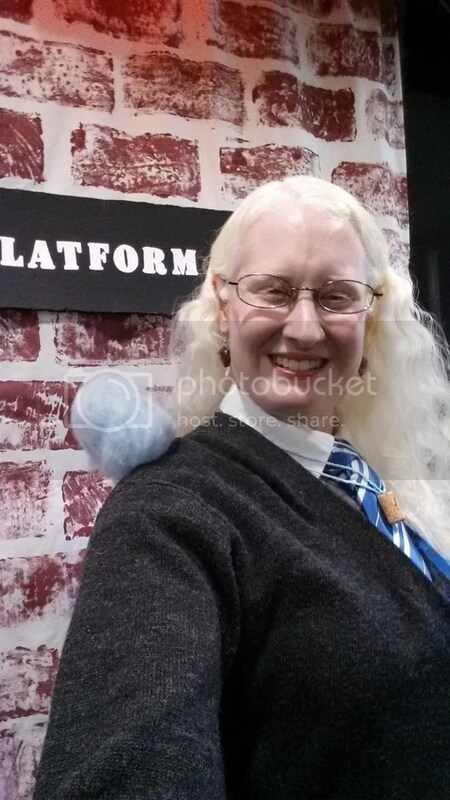 I ran HP fansites growing up, I participated in HP roleplay, wrote HP fanfiction, went to HP conventions like Infinitus and LeakyCon, and cosplayed as Narcissa Black/Malfoy, Luna Lovegood, and Fleur Delacour. 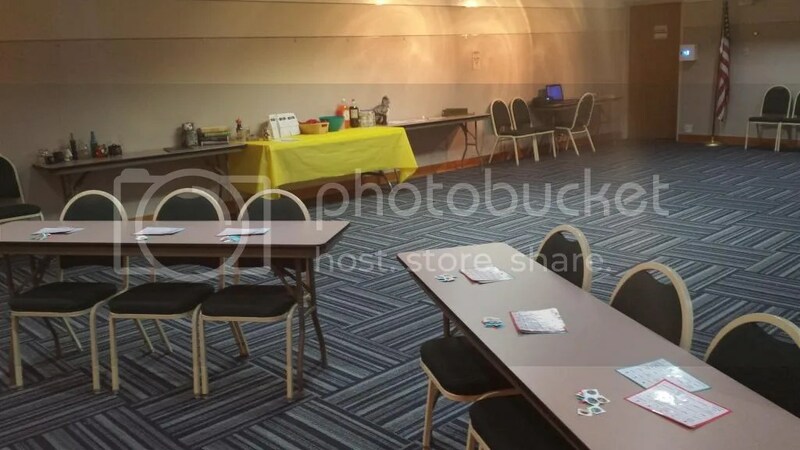 It’s my thing, so they knew that I would put together something fantastic, and I was excited since I hadn’t thrown a Potter party in at least four years or so. 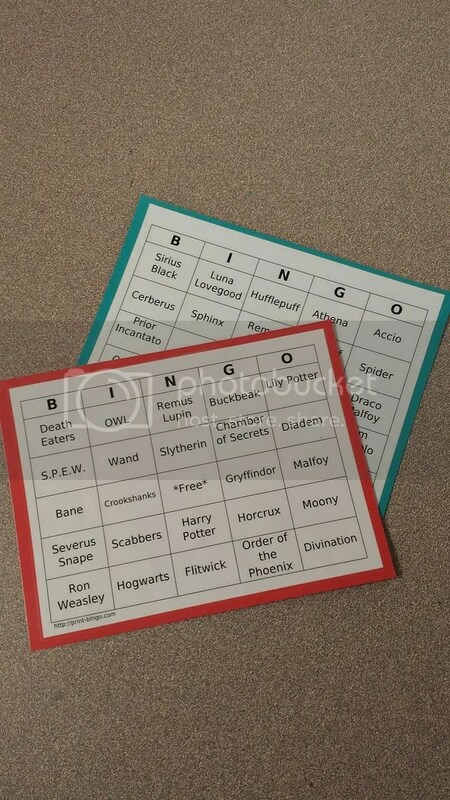 I found a site to create your own Bingo cards and just plugged in some Harry Potter words. I made one card (the blue one for Ravenclaw) for people more familiar with the books where I would give them a clue like “Centaurs roam the Forbidden Forest by Hogwarts. In Greek mythology, centaurs are half man and half” that they would have to answer (“Horse”) in order to find the correct square to cover. 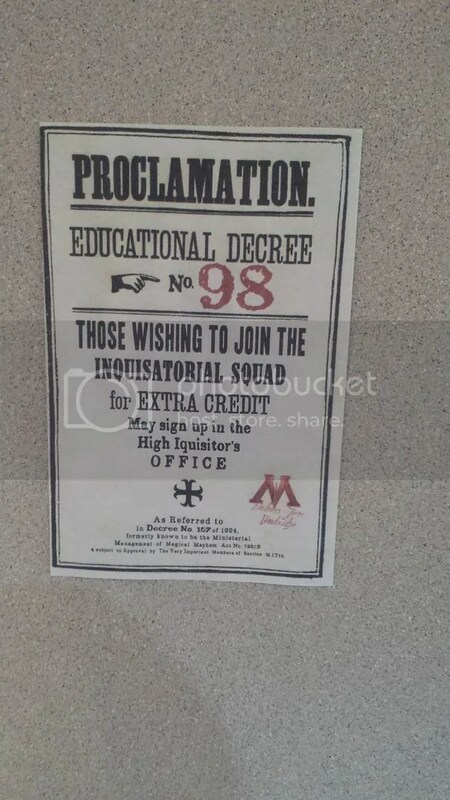 The red cards were more straightforward, and I would just call the words on the cards themselves for those who weren’t familiar with the books or thought the Ravenclaw version of this game was a little too intimidating. In addition to Bingo, we had Draw the Scar on Harry. 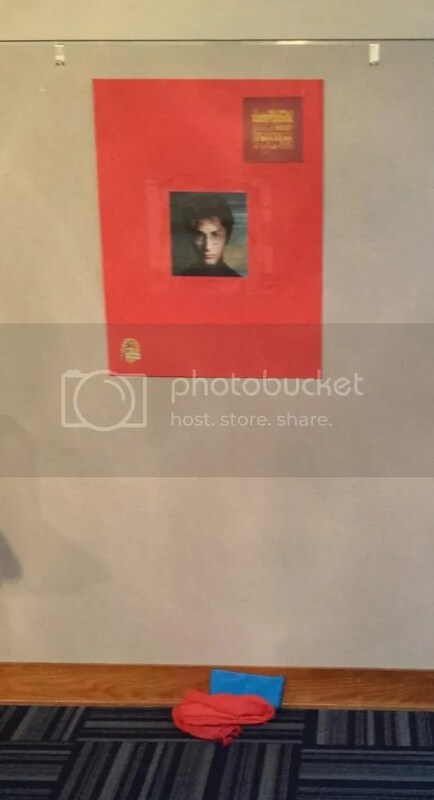 I used Pin the Tail on the Donkey as a model and blew up a picture of Harry, laminated it, and put it on a poster. That way, each player could have a different color dry erase marker to try to draw the lightning bolt scar on Harry’s forehead in the correct position while blindfolded. The person who got the closest won, and we could just erase the marks and start another round. 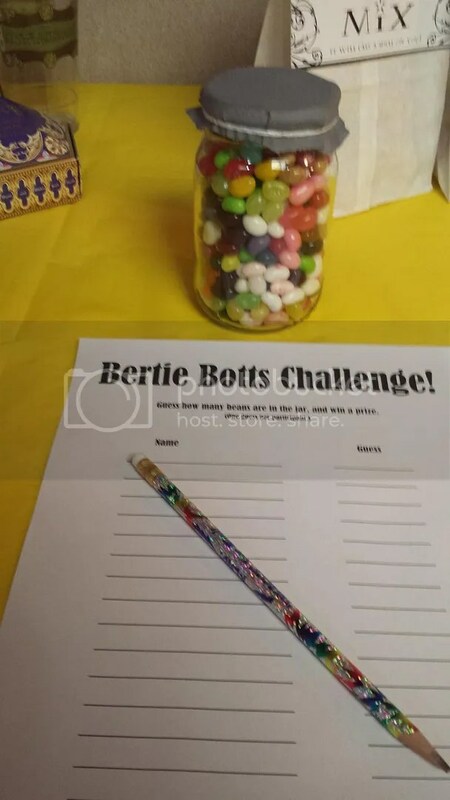 Our final small game was a Bertie Botts Challenge. 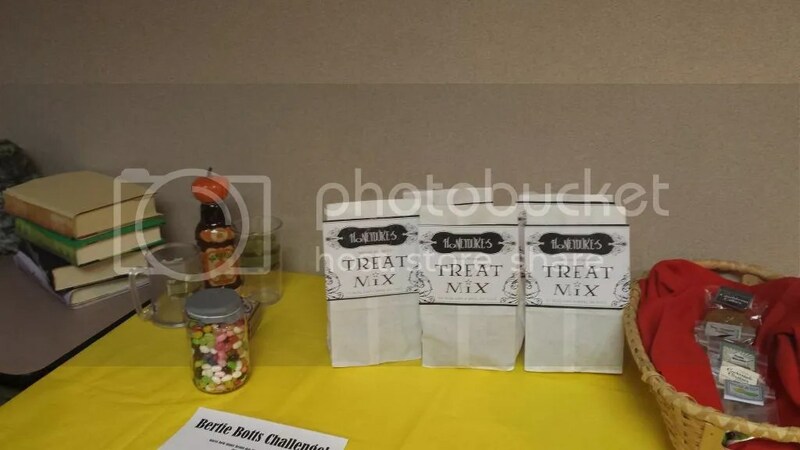 I was warned when I was planning this program that the teens had been forced to eat the actual Bertie Botts Every Flavor Beans that you can buy at the store at a previous Potter program, and they had hated it. Personally, I hate them too. So, we did a “guess how many jellybeans are in the jar” game with regular old jellybeans. The person who got the closest would win the jar. But you won’t find Mother Goose near these nursery rhymes. For how else would you check out the tales of this bard? 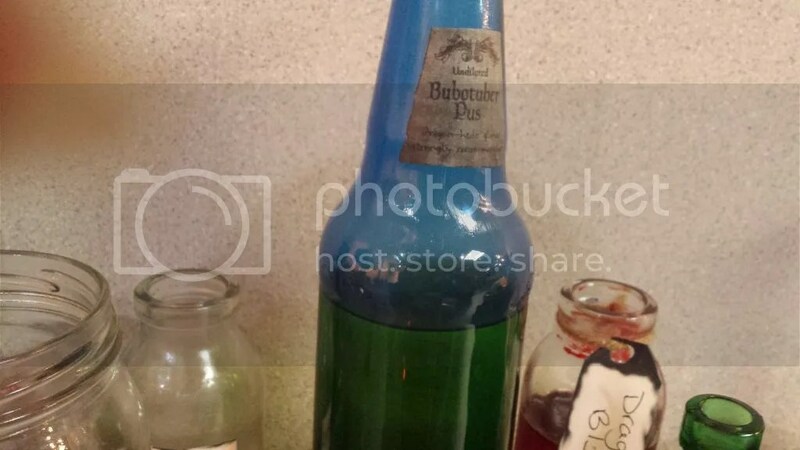 This led to The Tales of Beedle the Bard in my Harry Potter book display in which was hidden the next clue and the diary horcrux. Not much is seen of vampires in the world of young Harry. But what we do see makes they seem a bit scary. They feared the sun, but didn’t sparkle and glitter. This led to Twilight in my “Other” book display in which was hidden the next clue, a set of scrambled letters, and the ring horcrux. Unscramble the letters and a word you will find. If you cannot, you’ll be in quite a bind. This led them to the kitchen where they found the next clue with the cup horcrux. This clue certainly separates the wheat from the chaff. To find what you seek, you must venture where none walk but staff. But in it, we keep all supplies that are spare. 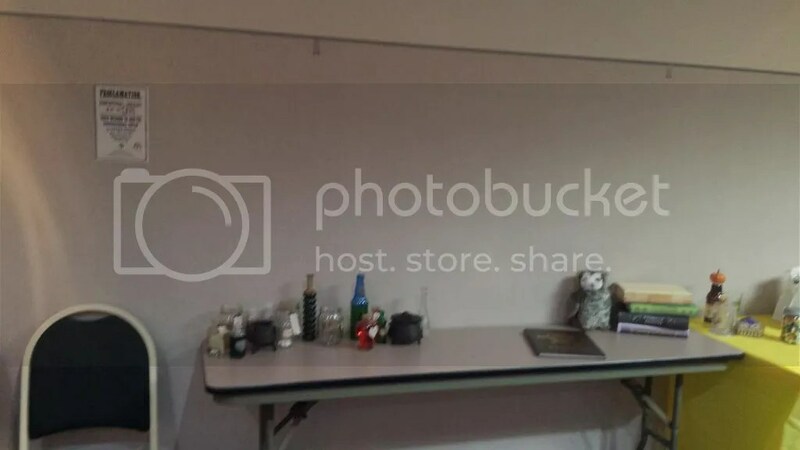 This led to the staff supply closet in the meeting room in which was hidden the next clue with the snake horcrux. You’re getting close but still so far. What you seek next might fit a queen or a tsar. You must prove your worth, I decree. And Rowena Ravenclaw must surely agree. For the next item you must unearth. The answer is a candle, so this led them to a battery operated candle on one of the tables where the next clue was hidden with the diadem horcrux. One more item, and then you’re off the hook! This led them to the History of Magic spellbook I’d made and the final (locket) horcrux. 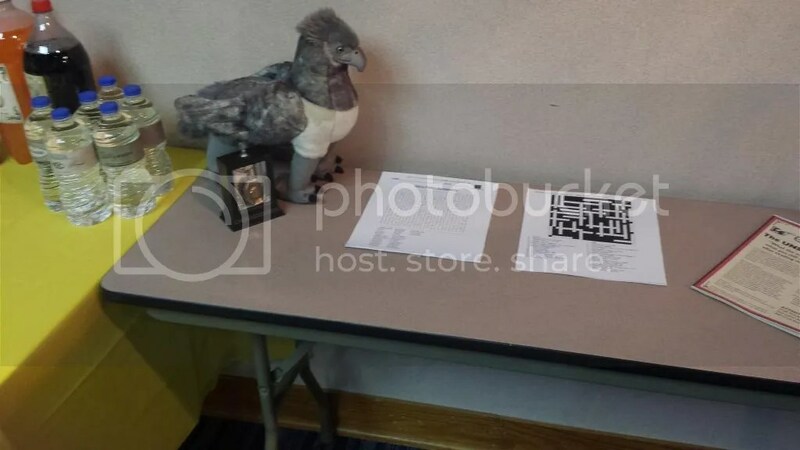 I also set out some Harry Potter crosswords and word search puzzles that I found online. 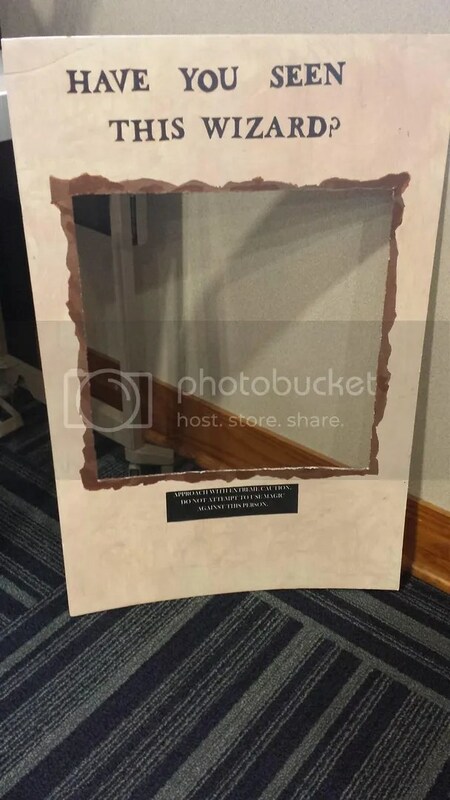 I knew that in order to have a great party, you need to have a photo booth so I set aside some time and money to make some great photo booth props. First, I bought a set on Etsy that you can just print out and attach to dowels. It was easy and cost about $9. 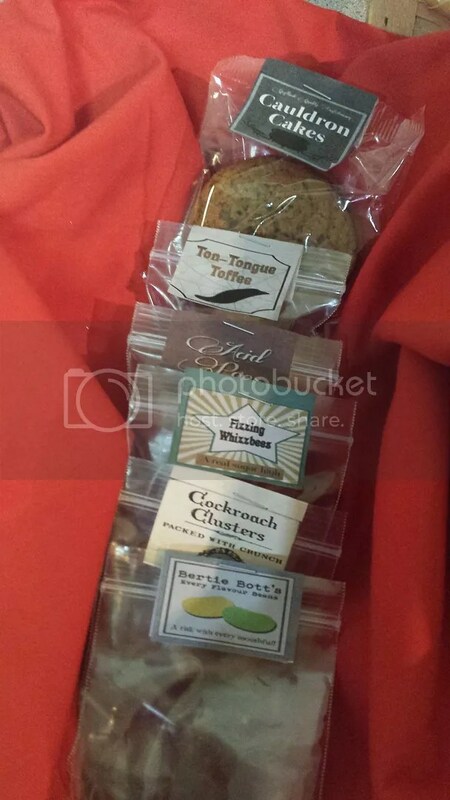 There’s another set for about $12 and another for about $8. I already had the Spectrespecs at home from my Luna costume. 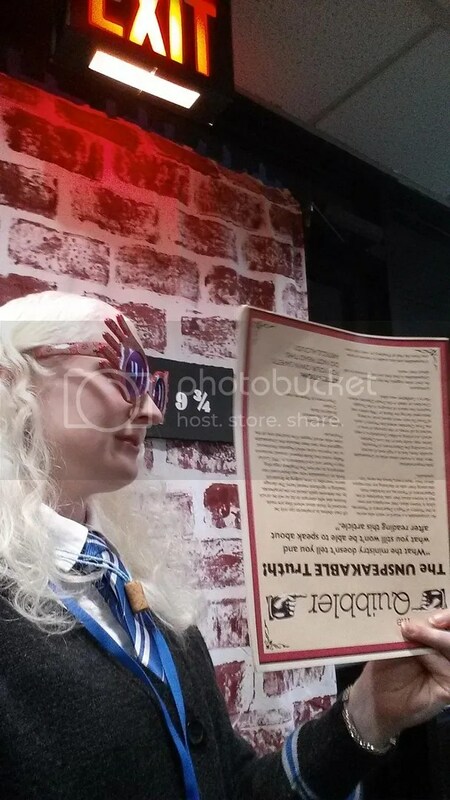 Then, I made a wanted poster similar to the one seen in the movies for Sirius Black as well as an Azkaban sign to hold (which you can see above under the props) for the photo booth. I used a technique similar to this tutorial, but I ended up just cutting out all my letters by hand and gluing them on the sign after painting it to look weathered and torn. 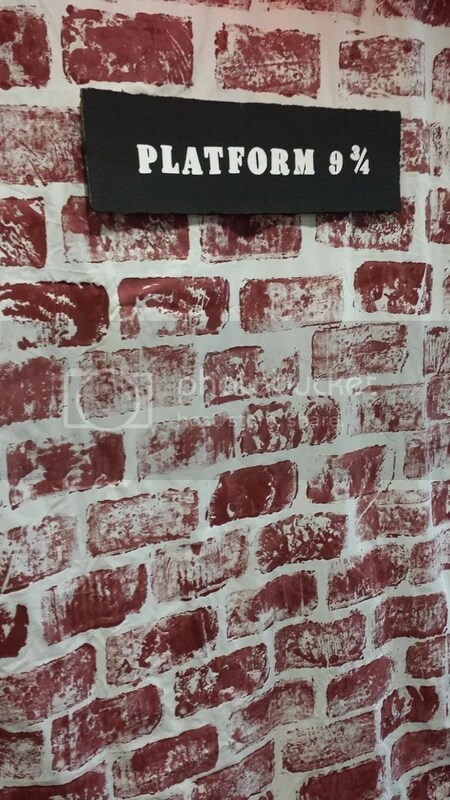 For our backdrop, I just took a plain white sheet, cut it to the size I wanted, and stamped it with a spare brick dipped in red paint to make it look like a brick wall. Then, I made a sign to hang on it, and voilà! We had Platform 9 3/4. 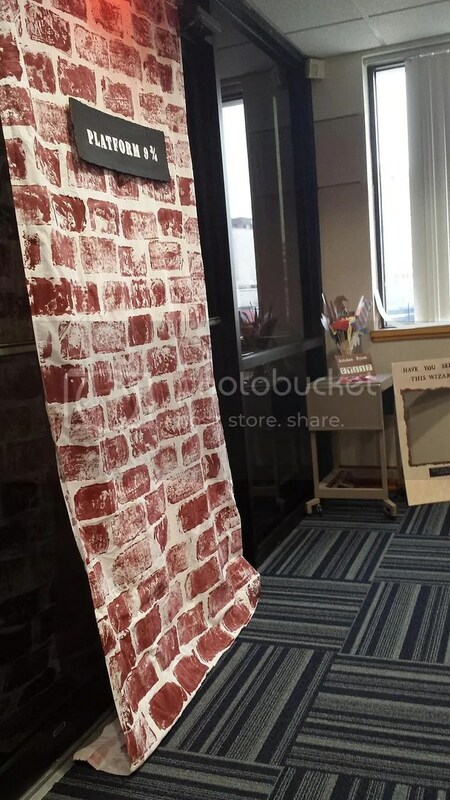 You could also cut a slit in the sheet to use it as an entrance/door, but I wanted it to be solid for the backdrop. 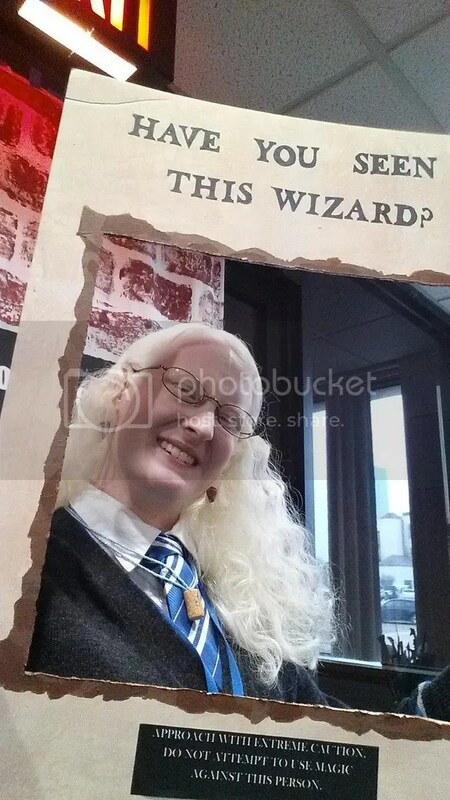 Here are a few photos of me at the photo booth all dressed up in my Luna Lovegood costume. I am a huge wizard rock (or “wrock”) fan. If you’re familiar, it’s a genre of music based on the Harry Potter novels. Though other fandoms created their own genres (“Twi-rock,” for example), wizard rock was the first genre of music inspired solely by a series of books. There are plenty of amazing songs and wizard rockers out there, and I ended up going through my own wrock library and finding teen-appropriate songs. (Be very careful if you choose to incorporate wrock into a teen program because some lyrics aren’t appropriate for all audiences). I stuck with bands like The Butterbeer Experience, The Ministry of Magic, Marked As His Equal, and (my personal favorite) Oliver Boyd and the Remembralls. Since we had so many games, we have to have prizes, right? 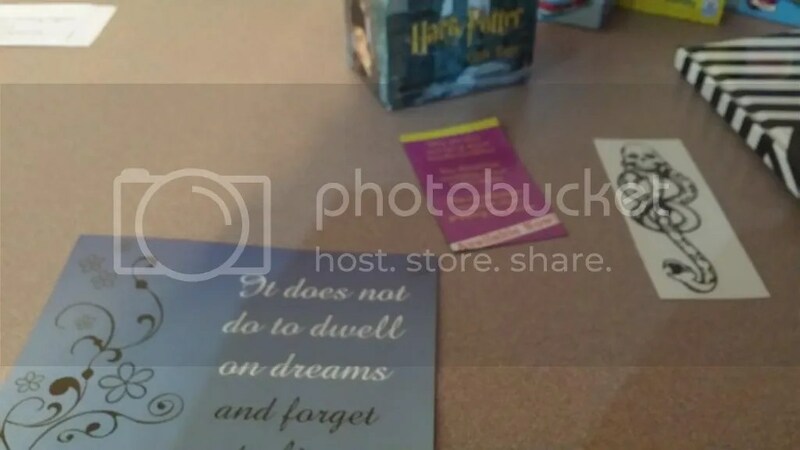 I dug around in my collection of HP stuff and found a few magnets that I felt comfortable parting with as well as a few Dark Mark temporary tattoos, some Harry Potter gift tags, a couple journals, and some candy leftover from the Family Feud program. I also set up a Pottermore station with our laptop so the teens could check out the site that JK Rowling made to supplement the books. If you’re not familiar with Pottermore, you can get sorted (by a quiz that JK herself designed), buy books and pets, make potions, and see amazing artwork for each scene described in the books! Now, all that is left is decorations which were some of the most fun to create! I started with my potions table. 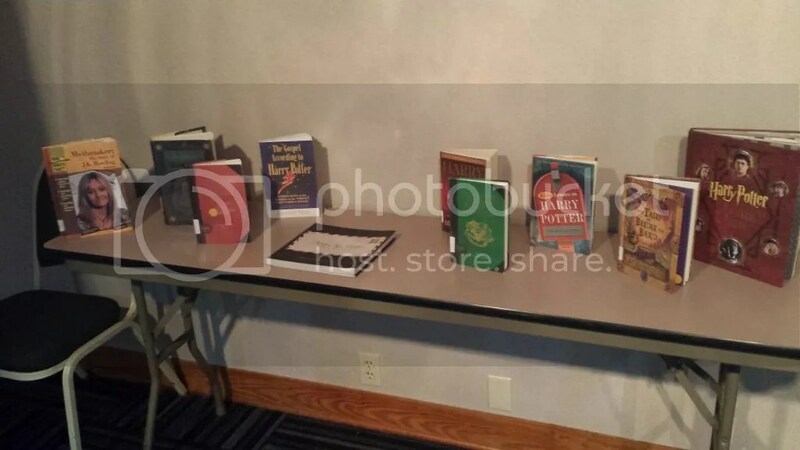 The Hogwarts yearbook on the potions table was actually the program from LeakyCon 2011. It just went so well with the décor that I had to include it. 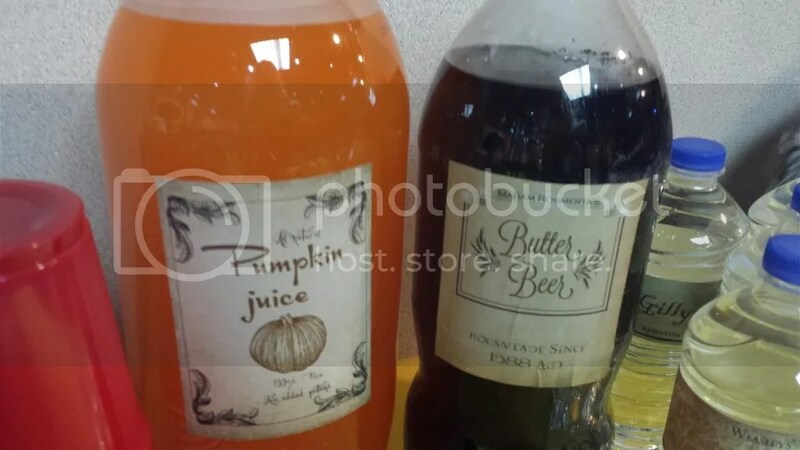 Now, on to the potions! 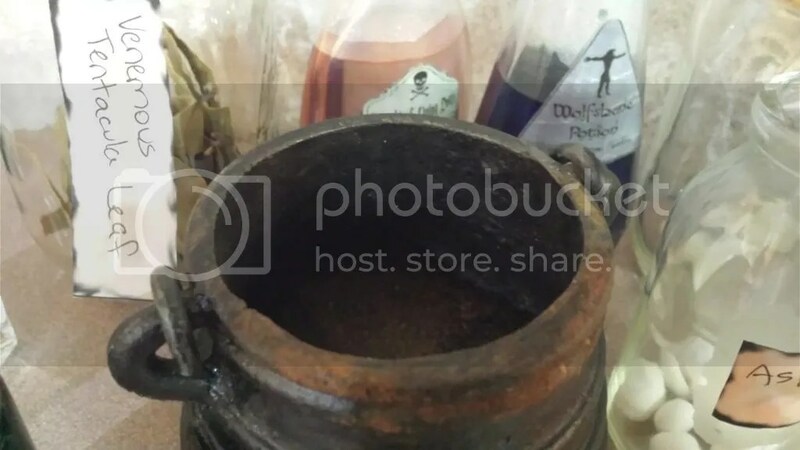 I already had the cauldrons at home. 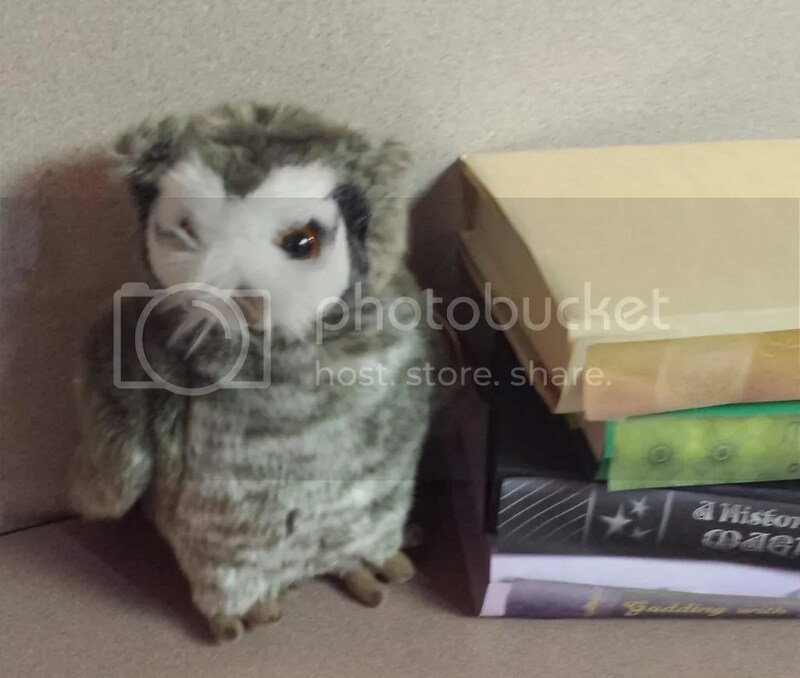 I bought one at the Wizarding World of Harry Potter and one was a present from a friend. 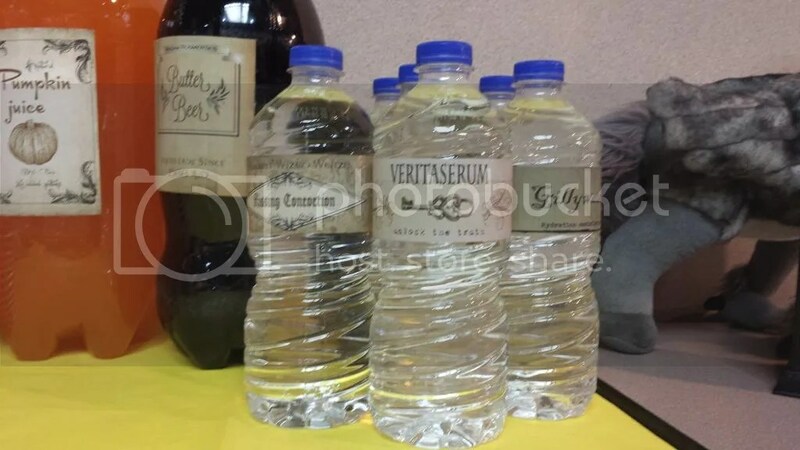 Then, I found printable labels for the bottles and cut them out. 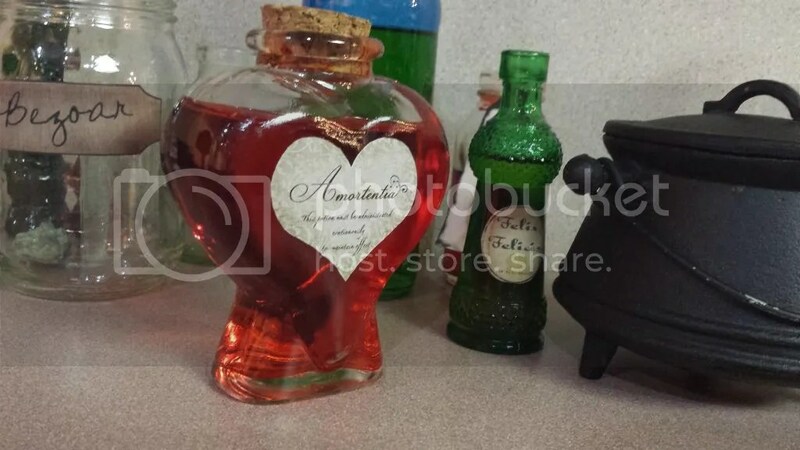 Most of the potions are just water with food coloring in pretty bottles (some of which were donated and some of which came from Michaels). 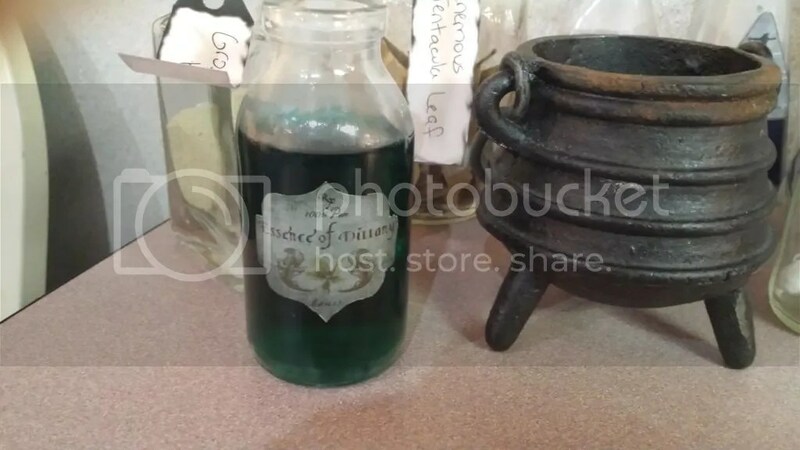 I just got on the Harry Potter wiki and found out what color the potions were supposed to be and got the coloring as close as I could. 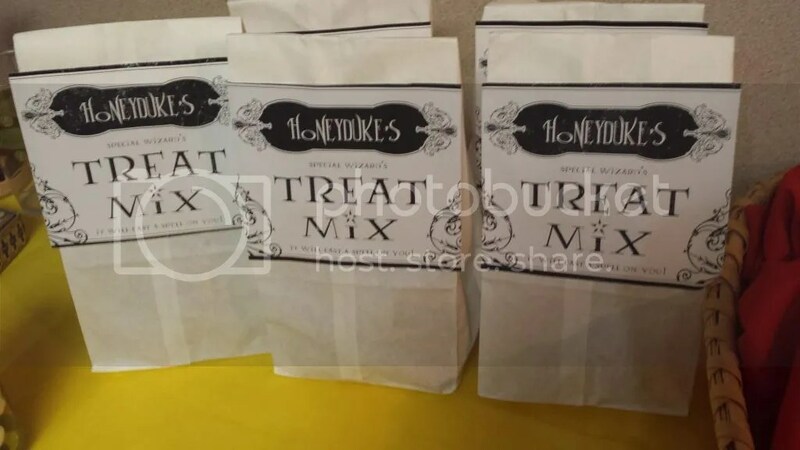 For some of the ingredients, I had to make them myself. 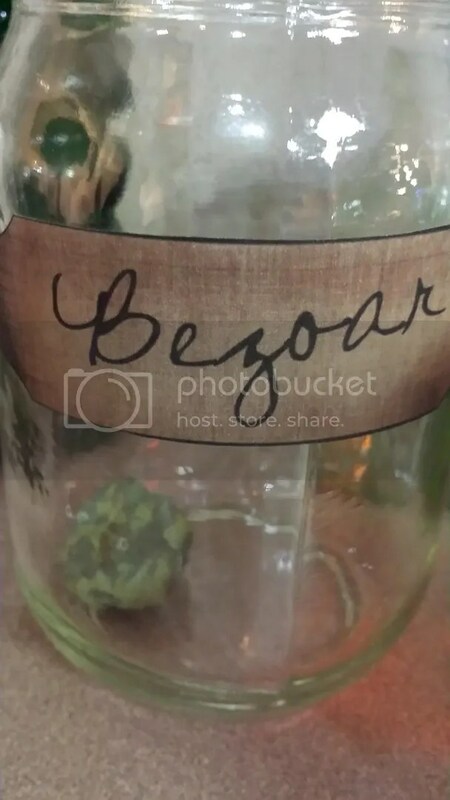 The bezoar is air-dry clay with lumps of glue painted as gross a color as I could manage. I ended up asking my co-workers every hour or so if it looked disgusting enough to have come from the stomach of a goat. This was the end product. 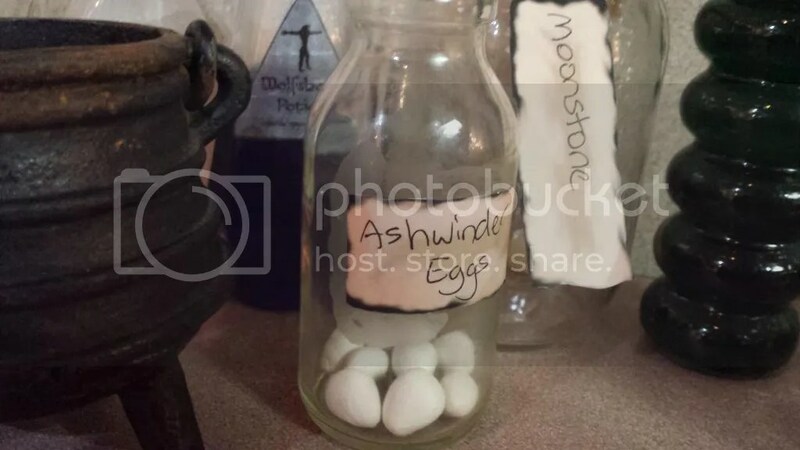 The ashwinder eggs are just air-dry clay, and the moonstone I had at home. I mixed up some stage blood for the dragon’s blood (see the recipes on my Special FX Halloween makeup program post). The ground bicorn horn in the back is just sand, and the venomous tentacula leaves are bay leaves. I just used air-dry clay, wooden dowels, some paint, and some modge podge to make these. It was pretty simple. 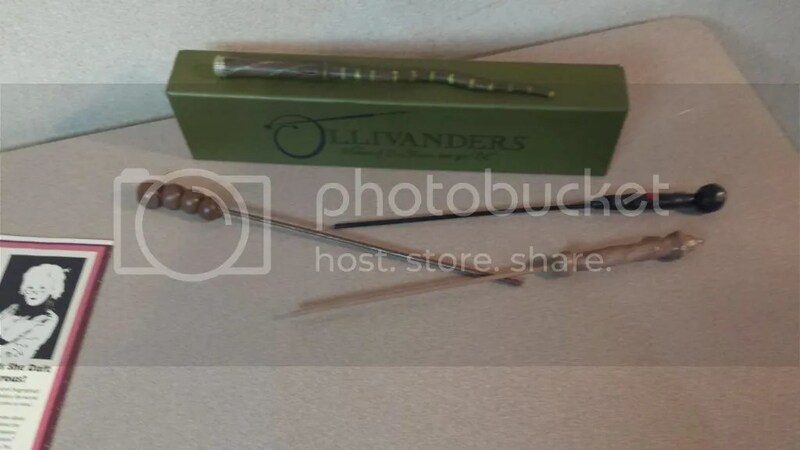 I was trying it out (as well as a few other methods for making wands) with the idea that I would incorporate this craft into the program, but I quickly realized that it was too time-consuming to be part of any program. It would need its own time slot. 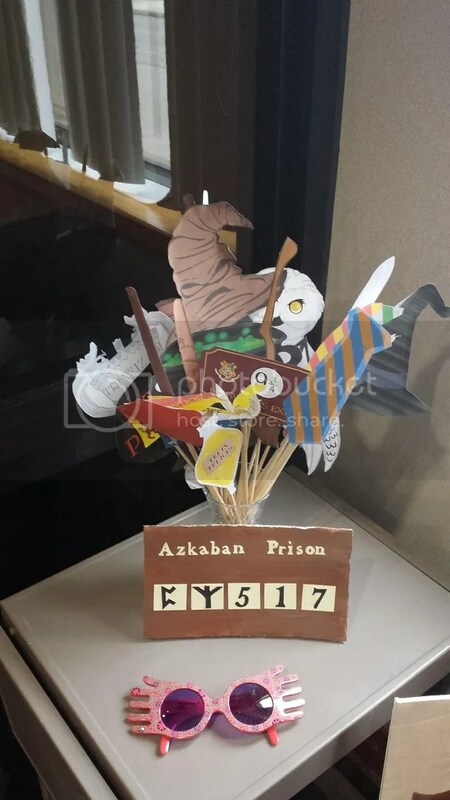 So, these would-be “examples” turned into decorations along with the wand I bought at The Wizarding World of Harry Potter during the Ollivander’s experience when I was chosen. 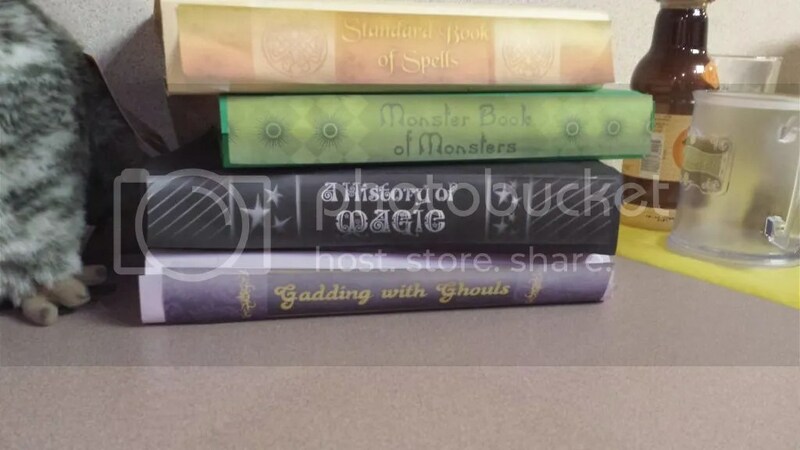 I made these spellbooks by just printing out the covers from this site and covering old books with colored paper. 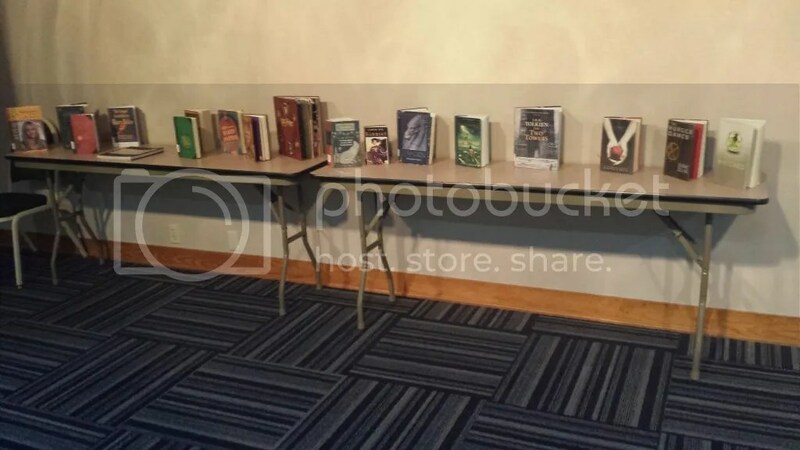 I also set up two book displays, one for Harry Potter books and the other for related young adult books. 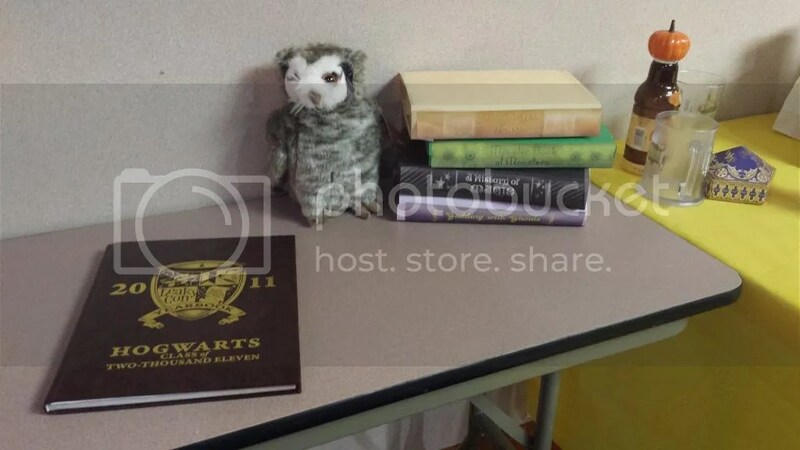 I included The Tales of Beedle the Bard, Fantastic Beasts and Where to Find Them, Quidditch Through the Ages, and several books written about the series and fandom like Harry, A History and Dear Mr. Potter in my Harry Potter display and other very popular YA books in my related display. 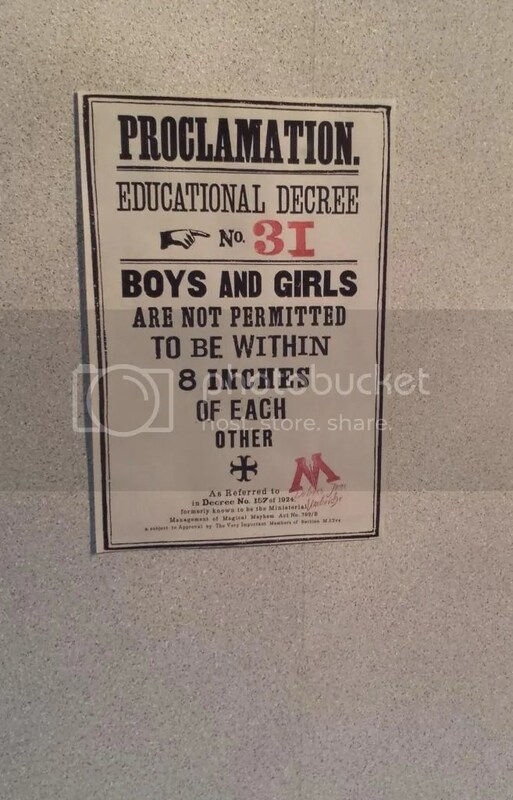 I also hung up a few Education Decrees around the room as a finishing touch. 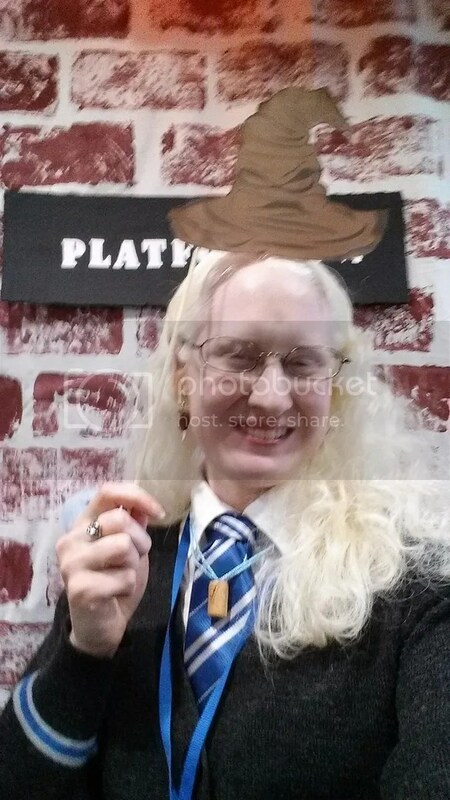 And that was our Harry Potter party. All together, it cost about $35 because I had so many materials at home.